I have 2 businesses, which both happen to be in the wedding industry. My crafty business, Bridal Bling Australia is my full time business and I also do wedding hair & makeup. As I'm getting older my poor shoulders can't handle doing hair and makeup for the numerous bridal parties every weekend, so I now mostly do past Brides & their friends. I am married to the most wonderful man on the planet. My hubby, John, is not only my biggest supporter, he also keeps the household affairs up to date (including the cooking and most of the washing), allowing me to work on my business. I also have two daughters (one nearly 20 and the other 18.5) who are both a big part of my business. They are always willing to help out when then can, especially when it comes to the fiddley jobs that require good eyesight, that my eyes can sometimes struggle with. I also have 2 furbabies (both are Chihuahuas) that keep me company during the day, while my husband works and daughters are off studying. I've lived in different suburbs of Brisbane all of my life. 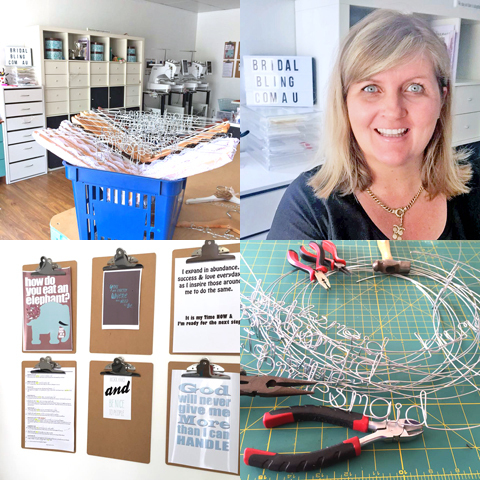 We have recently moved to the south-western suburb of Greenbank where I have a "she-shed" (more commonly known as my "bling-cave") for my business and craft supplies. Working from home is great, I would highly recommend it to anyone who likes to wear their pjs all day and go for a dip in the pool as often as they want (especially in summer). And a bonus of working from my "bling-cave" is that I often see kangaroos while sitting at my desk or while making hankies. The most popular item I make is the personalised hanger. For this I mostly bend wire, this is more often than not done in my pjs, much to my liking. Other popular items, including the personalised teddies, hankies and robes, are made with the help of my newly purchased and beloved "twins", Phil and Lil (two multi-needle embroidery machines). I have what seems to be an endless supply of ribbons for the personalised garters I make and a whole cupboard dedicated to the different styles of charms for the memory lockets and key rings I customise for Brides. I take most of my inspiration from wedding trends. I follow lots and lots of wedding bloggers, facebook pages and instagram accounts both in Australia and overseas (my newsfeed looks like I'm newly engaged and planning a wedding). I also listen to my brides, if they are asking for something that I don't make, I'll look into making it. I am lucky enough that my AWESOME friend, Maxine, is super clever (though not super crafty), and is able to help me figure out the "how to" for all my new business ideas, sometimes over a bottle of wine (or two). While I am the idea gal and worker, she is the real brains behind my crafty creations. I've been in the wedding industry full time for over 20 years now and I have been doing my Bridal Bling business full time since 2011 (and boy how far has my range come since then!). I've been creating all my life and sadly I've not really mastered anything. I just like to give things a go to see if I can do them. Once I know I can do it I normally get bored with that project and then take on another. I think that is why I have so many different items in my shop; I'm always introducing something new to my range (it stops me from getting bored). My business name was simple. For 12+ years I've been doing bridal hair and makeup and that business is Kelly Weavers Bridal Hair. Whilst doing bridal hair and makeup I started making Bride coat hangers as gifts for my brides. It was one of my past Brides that gave me the idea to turn these 'gifts' into a business. I knew that I had to differentiate between the two businesses, and as I already had Bridal Hair, I though Bridal Bling had a nice ring to it and it also kept it simple for me. I have one business that is bridal hair and the other is bridal bling. I regularly attend embroidery classes at my local sewing shop, where I am able to expand on my knowledge of embroiding. I have recently attended an event in Melbourne (the Artful Business Conference) and was able to meet the lovely Elle Roberts, who is a 'makers' business coach and mentor and runs the Makers Mastermind group. At this conference I was also able to learn ways to broaden my business, as well as speak with other small business owners and get hints and tips from them. It was also extremely motivational and inspiring to connect with so many wonderful 'arty' people face to face. I'm still buzzing from the experience. As Nike says..."JUST DO IT!!" It's simple, if you have an idea, just "Give it a go"! Seriously, what have you got to lose? Just a little time and a little money, which is nothing compared to what you could potentially gain!! Don't bother waiting until the 'perfect time' or for when you have everything you need in place, that day will never come. There will always be something else you need before you can start... so don't put it off and just START NOW! I highly recommend that people listen to their target market and adapt/change for that as needed. Also, be sure to take professional looking photos of your products! I see so many great products out there but they only look just 'ok', BECAUSE they are photographed poorly. Your photos need to look consistent and professional (which isn't hard these days with all the photo editing apps and programs out there). 1) Find yourself a networking group of like minded people and don't be afraid to ask questions. You will find that people are more than willing to help others! The madeit facebook group is great for this and I also highly recommend Elle Roberts , Makers Mastermind group, which is membership group of like minded crafters/business owners all wanting to improve their business. 2) Do one little thing each month to make your business 'feel' more professional. Purchase business cards, get return address labels, buy a shirt and get your business name printed on it. It can be anything little, the thing is to keep moving forward and move forward slowly if needed but keep becoming (feeling) more and more professional each month. I could go on for hours about advice for start up businesses. I'm all for people being their own bosses and running their own business and "just giving it a go!!!" Get active in your community. Find facebook groups and get yourself known, but don't just push your own products, also be active in answering questions. If people see your name often enough they'll get interested in you and what you sell. Don't just stick to facebook, try lots of different advertising platforms, try pinterest, twitter and instagram, why not give it all ago? My target market is mainly Brides and I'm happy to say that I don't get to many bridezillas, but I have learnt that sometimes it's better to cut your losses with some customers. Give them a refund (even if you know that they don't really deserve it). It is easier to give them a refund and get them out of your happy business zone, instead of having negative vibes around your business. Let them go, wish them well and move on to bigger and better things (& better customers for you.) Practice good business karma and don't take it personally. You can't please everyone all the time! I have played netball all through my childhood and both of my daughters have played it since they were young. I no longer play, but instead I now coach. In the past I have coached both my daughters club netball teams, however these days I coach younger rep teams, which suits me as it is a shorter season. When my daughters play now I have to remind myself to be a mum and not a coach (once a coach, always a coach!). I also really enjoy travelling with my family. I mostly enjoy the Asian countries, because of their delicious food and how friendly all the people are. I have travelled to Thailand and Vietnam most recently, and will definitely go back in the next year or two. I love modern country music especially Keith Urban. I am always playing his music whilst working in my "bling-cave". I have also been listening to Hawaiian music recently as I work, as it keeps me in a happy chilled mood. Most of the books I like to read are inspirational/motivational. The inspirational books that I have read lately are 'Lucky Bithy' by Denise Duffiefiels-Thomas, 'Big Lead' by Gay Hendricks, 'Profit First' by Mike Michalowicz and 'Big Magic' by Elizabeth Gilbert...... I do like a good novel, and nothing can go past the Hunger Games series, but other than that, most novels aren't always memorable enough to remember the title. I love going to the movies, that would be one of my favourite 'chill out' times. I pretty much like most movies, but my all time favourites would have to be The sound of Music, Grease, and Pitch Perfect (I guess I like songs I can sing along to). There is one movie that I would have to rate as the worst one I have EVER seen, and that would be Birdman, I don't understand how it won so many awards. I am a huge fan of phone apps; I believe that they make life so much easier (especially for me and my business). I use 'snapseed' for photo editing, 'a beautiful mess' and 'layout' both of collages. And of course, I cannot go past the Facebook, Pages and Instagram apps. My perfect fantasy day would be a full day of body pampering. A massage, a facial, a pedicure, hair cut, colored & blow dried, the full works. Then have my makeup done because I'd be off to have a nice dinner (& drinks) with my family, whilst we are away at some beautiful resort. And I might as well add chocolates and roses in there somewhere too (that would be a day of pure BLISS!). But a perfect "normal" day would be when my embroidery machines are playing "nice" and I don't run out of bobbin thread mid project. I remember to eat lunch before 4pm and get to the post office before it shuts! Who is one of your favourite madeit sellers, explain why in less than 10 words? sydandme I love how over the years her range has changed and evolved. It's so colourful these days.